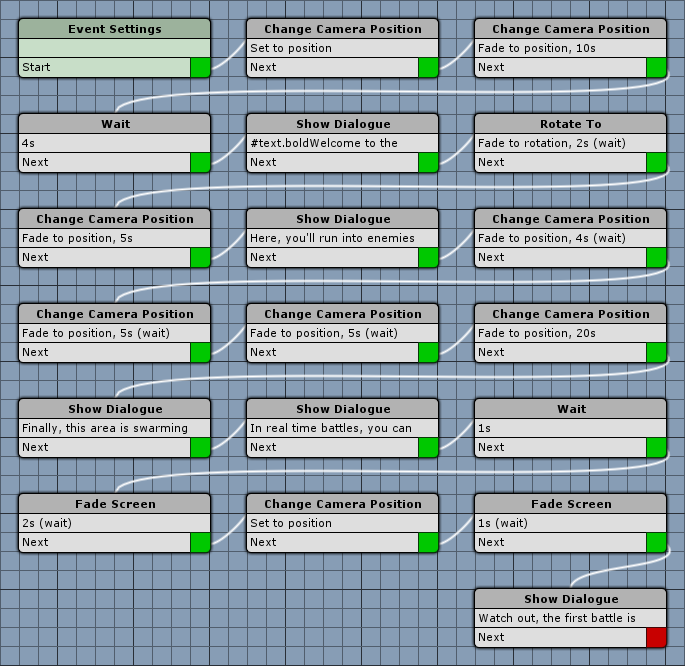 In our Game Event, we’ll do some camera changes and display Auto Close dialogues. Open the field scene (2 Field, found in Assets/Tutorial Resources/Scenes/). We’ll use game objects in the scene to position the camera – while we could also do this using Camera Positions, it’s easier to use exactly placed objects in the scene for this one-time event. Camera positions are more useful when they’re needed multiple times, e.g. in battle events or for reused cinematic shots. We’ll add 7 empty game objects (using the Untiy® menu GameObject > Create Empty) to the scene and name/place them like this. Set to X=325, Y=43, Z=483. Set to X=30, Y=180, Z=0. Set to X=308, Y=36, Z=413. Set to X=0, Y=200, Z=0. Set to X=272, Y=24, Z=428. Set to X=15, Y=270, Z=0. Set to X=246, Y=13, Z=418. Set to X=340, Y=210, Z=0. Set to X=235, Y=42, Z=392. Set to X=0, Y=210, Z=0. Set to X=207, Y=60, Z=365. Set to X=20, Y=210, Z=0. Set to X=48, Y=73, Z=218. Set to X=10, Y=70, Z=0. That’s it for the camera position objects – save the scene. Click on Create New Event in the object’s inspector to open the ORK Framework editor and create a new event. We’ll need two actors – the camera and the player. Click on Add Actor to add the first one. Click on Add Actor again. Now, we’ll add the camera position objects we created as Waypoints – add 7 waypoints to the event and change the following settings for all of them. Where X is the number of the current waypoint – so, CamPoint0, CamPoint1, CamPoint2, …, CamPoint6. First, we’ll set the camera to the position and rotation of the our first waypoint. Now, we’ll fade to the position and rotation of the next waypoint. While the camera is fading, we’ll display the first dialogue. #text.boldWelcome to the field!#<styleYou’ll fight different kinds of battles here … on this road, #text.bold#text.color3#Turn Based#<color#<style battles await you. You won’t see your enemies coming! The player can’t close the dialogue. Now, we rotate the camera to the next waypoint. And move it to the next waypoint. Here, you’ll run into enemies that you can see – and fight them in #text.bold#text.color3#Active Time#<color#<style battles! Finally, this area is swarming with enemies you’ll have to fight in #text.bold#text.color3#Real Time#<color#<style battles! In real time battles, you can use #text.bold#text.color2#Space#<color#<style to attack, and #text.bold#text.color2#Left-CTRL#<color#<style to open the battle menu. And we’ll return to the player. A final warning for the player. Watch out, the first battle is right ahead! And that’s it for the event – click on Save Event and save it as fieldIntroduction.asset in Assets/Events/Field/. Close the ORK Framework editor. Back in the field scene, we’ll set up our event to automatically start when the scene is loaded the first time. We’ll let the Event Interaction handle setting and checking the game variables. With the event object selected, change the following settings in the Event Interaction inspector. 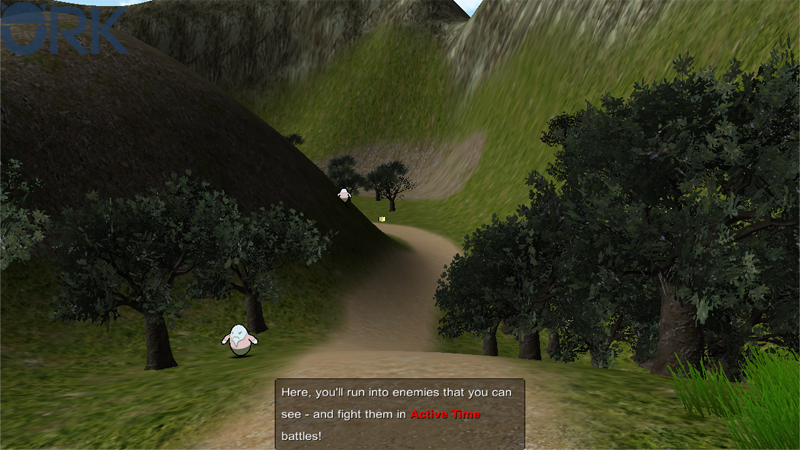 Now, we’ll set up variable conditions so that our event will only start the first time we’re entering the scene. Now, the event will only start if FieldIntroduction is not true. Finally, we’ll let the event interaction set a variable after the event has finished. Click on Add Game Variable. After entering the scene, the new event will automatically start and take us on a tour around the field. And that’s it for now – the next lesson will cover creating the crafting system.